It was a cold and windy day, but the sun was out and there was no risk of rain, so I finally got to take the bike out for a little spin. It was a short one, just over and down the hill to lunch and the coffee shop so I could get some work done and also maybe, just maybe see some real live adult people. I’ve been snowed under by the grind of teaching every day, and it felt great to get out of my house and my office and wake back up to the city. I locked up to an actual bike rack on North Avenue and headed into the coffee shop. I saw C., who mentioned he saw me in the paper (my mother was so proud, I told him). And there was M., whose dance party is making the guy who bought and closed the leather bar mad–the party’s still going on. G. was there, waiting for a table–he saw my bike outside and wondered if I was drinking coffee or beer (I’d do both before heading home). E. came in with his bike gear, too, and C.R, meeting G. for a massive nerd summit. And R. joined me at my table and we talked dissertating and how to get out of academia and what it costs to rent a place around here–a lovely chat with someone I usually only see online. And that was the day–a reminder that yes, I do indeed live here in Baltimore, and even if I have to duck out for a bit. It was good to see the neighbors in the neighborhood. A quick beer and some pickles next door (it works, I swear) and then I was back on my bike, pedaling into the wind and up the hill. 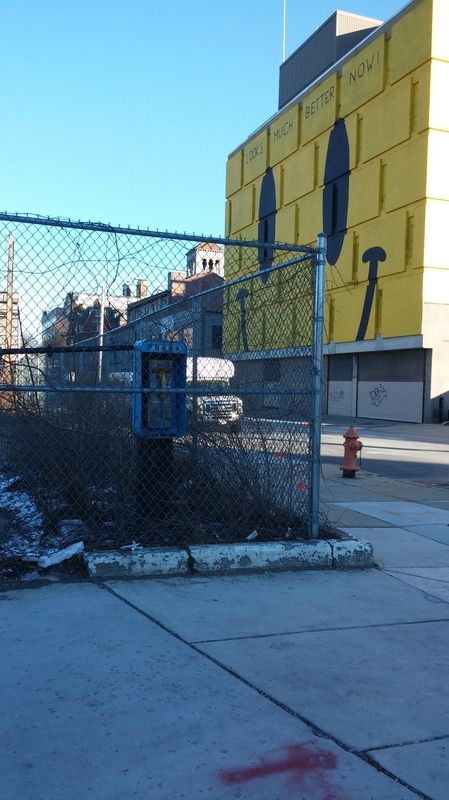 I stopped at the corner of 20th and Charles to snap this picture of a public phone behind a fence, that horrible mural still in the background. All sorts of stuff falls apart, like a shared telephone infrastructure, but I bet it’ll be many, many years before that abomination slides off the wall. That lot has been empty for at least the past year, probably longer. The empty lot down the block’s now a public gathering space with new trees and a stage for all kinds of things. I wonder what it’ll take to get this empty space converted into something more useful than taunting us with the reminder that we didn’t used to have to all carry our own private phones around in our pockets (not that I don’t love carrying my own private phone in my pocket with me–let’s be clear). It was a short ride today, but a good reminder that the bike’s still here, and so’s the city. This entry was posted in personal and tagged Baltimore, neighborhoods, people, public phones, Station North. Bookmark the permalink.